Gerry and Helen Kiely have been selling flowers and plants and providing gardening advice for over 30 years in the Milk Market. “Gerry used to come in as a young fella with a couple of geraniums on the back of bicycle in the Seventies during the summer months. His mother, Theresa, gave him his love of plants and flowers,” Helen, 56, explains. “When we got married I couldn’t tell a daisy from a rose and it was Theresa who taught me everything,” Helen laughs. 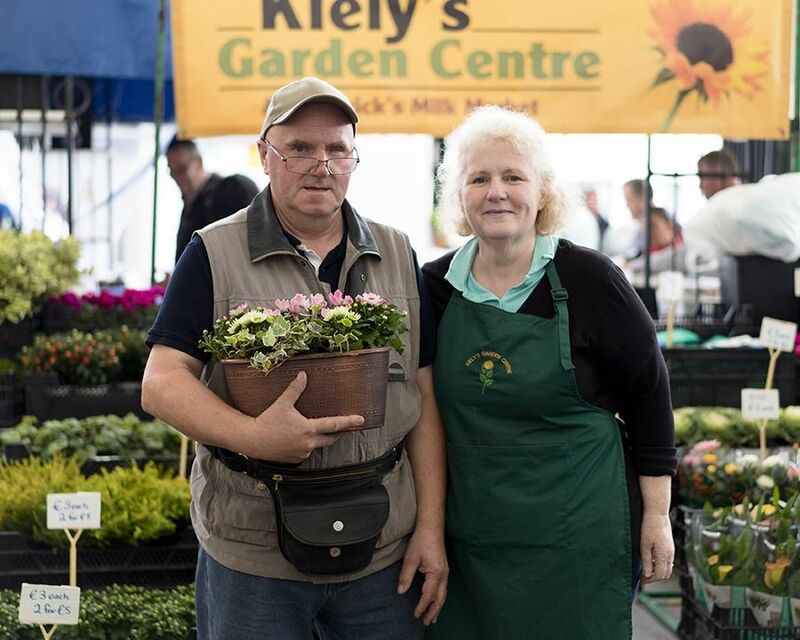 Ger and Helen Kiely of Kiely’s Garden Centre at The Milk Market pictured at Limerick Milk Market. anything and make it grow,” Gerry said. Gerry inherited his mother’s love of flowers and plants and set up the Kiely’s gardening stall in the Milk Market in the early Eighties. Now, with more than 30 years experience each, Gerry and Helen can pass on their expertise to their customers at the Milk Market. “When we started in the Milk Market, we were selling out of a car and trailer with maybe a couple of each item for sale. But people were asking for six or seven things, so we set up our own garden centre in Ballybricken, out beyond Ballyneety, in April 1985. I remember the date exactly because it was April Fool’s Day. That ran for over 30 years. It closed with the recession but now we have expanded what we do in the Milk Market and we also go to other markets, so the garden centre is no longer open, but we are just as busy,” Helen said. Gerry, 61, agrees: “For me there’s nothing like the atmosphere in the Milk Market, it’s something you just can’t bottle up and reproduce somewhere else because it’s about the relationship you build up with your customers. I’d have a load of their phone numbers on my phone because they don’t just come and pick out something and go away, they talk to you about what they want and look for advice, and they talk to you about what’s going on in their lives. I have grandmothers and their daughters and their granddaughters who all come to us because of word of mouth and loyalty,” Gerry said. “We are the type of people that would rather lose a sale than send someone home with something that doesn’t suit their garden. We have clubs of mostly older people who come down to us from all over, from Dublin, Galway, Waterford, Wexford. Some people buy on the basis of colour – so they’ll buy roses, chrysanthemums, daffodils, tulips. Others buy fir trees, or heathers or bulbs. People are busy these times so they like perennial flowers, ones that you can just plant and they’ll come back every year. We sell pots and containers. If you want trees and shrubs, we have them too. When they were younger, Helen and Gerry’s sons Robert and David would help out on the stall for pocket money. Now Robert is in Australia, and David travels the country as a health and safety officer. So the husband and wife team do all the work themselves these days – with a little help from social media. “We go in on a Friday night and we set up the stall and we take photos of the different plants and flowers we have and what special offers we have and then we put those up on Facebook. Some of our regulars will check the Facebook and come in for the special offers,” Helen said. Gerry believes it’s the personal touch that makes not just the Kielys special, but the whole milk market.